A teaser photo of the car released Wednesday shows a fastback with a longer and lower body than the current Q70. NASHVILLE -- Infiniti signaled advance details of a sedan concept that it plans to unveil at this month's Detroit auto show. The Q Inspiration Concept suggests the design look for the next-generation midsize Q70, although Infiniti is not saying where it might fit into the brand's real-world lineup. A teaser photo of the car released Wednesday shows a fastback with a longer and lower body than the current Q70. The concept sports larger wheels and features a trimmer backside with a muted rear bumper. The company said in a statement that the concept "eschews classical sedan forms with its elongated silhouette" and represents "the next step in Infiniti design." "It is the first manifestation of Infiniti's new form language for an era of advanced powertrains," the statement said. 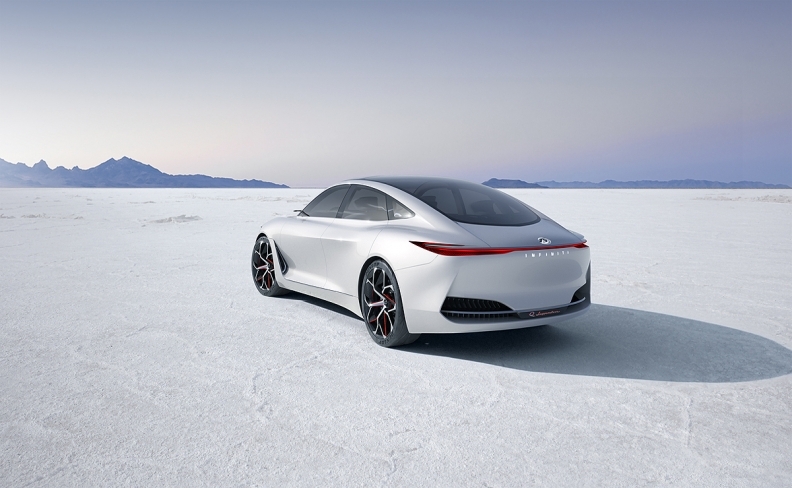 Karim Habib, Infiniti executive design director, said the concept has a shorter hood -- which means a smaller engine compartment than in the past. The design clue indicates Infiniti's interest in a nontraditional powertrain for a future sedan flagship with some degree of electrification. Habib said in the statement that the Q Inspiration "offers an alternative form; something more flowing in appearance with an unusually long and balanced cabin." He said Infiniti is "experimenting with new proportions in a typically conservative segment." The Q70, the brand's largest sedan, is in line for a redesign in 2019 or 2020. It posted 5,772 sales in 2017, a decline of 1.7 percent from 2016. Sales of all Infiniti cars rose 6.2 percent last year to 57,262, while sales of crossovers and SUVs increased 14 percent to 96,153 vehicles.